Volcanoes Safaris has been at the forefront of reviving gorilla and chimpanzee tourism in the region since 1997. Volcanoes Safaris was founded in 1997 in Uganda by Praveen Moman. We have been at the forefront of reviving gorilla tourism in Uganda and Rwanda. Twenty years ago Volcanoes Safaris was the first company to set up simple camps in the areas around the gorilla parks in Uganda first at Mount Gahinga and at Bwindi and later at Kyambura Gorge. Through a sustained development and investment program, the properties have been gradually improved as the region has opened up. A major upgrading program throughout 2017 completed their transformation to luxury lodges. In 2000, Volcanoes Safaris became the first international safari company to take clients to Rwanda. In 2004 we opened Virunga Lodge, the first international company to build a lodge near the gorilla park after the war. Today Virunga Lodge is one of Africa’s leading lodges, offering the luxury gorilla experience. Volcanoes Safaris helped kick-start gorilla tourism in Rwanda after the genocide through the Volcanoes BLCF Partnership Project. In 2005 the company become a charter signatory to the UN Kinshasa Declaration on Saving the Great Apes, the only private sector company to do so. In 2009, the Volcanoes Safaris Partnership Trust (VSPT), a non-profit organisation that aims to create long-term, self-sustaining projects that enrich the livelihoods of local communities and promote the conservation of the great apes was established. Today Volcanoes Safaris is recognised as the leader in great ape tourism. The company received the Travel + Leisure Global Vision (2012) and Condé Nast Traveler World Savers (2013) awards. In 2016 the VSPT Bwindi Bar near Bwindi Lodge won the Pure Community Engagement award for training disadvantaged youths; and Virunga Lodge was recognized as Africa’s most romantic retreat by the World Boutique Awards. In 2013, Praveen Moman, the founder was asked to join the Congo Basin Forest Partnership, which promotes sensitive economic development of the forests of Central Africa. Praveen has been described as a ‘visionary conservationist’ by the Financial Times and as ‘one of top twenty-five conservation-philanthropists’ in Africa by Departures Magazine. In 2014, Into the Virungas, a conversation with Praveen about his essential vision to champion the people, the animals and forests of Africa was published on the 10th anniversary of the opening of Virunga lodge. During the last twenty years we have had a clear vision. We have sought to develop lodges that are sensitive to local culture and aesthetics, connect to the local community and conservation projects and seek to use resources responsibly. We minimise the environmental impact of the lodges by using solar power when possible, harvesting our own rain water and recycling water and waste water when possible. At the same time to ensure we provide a luxury experience at our lodges, each lodge is having a back up generator installed to ensure power is available when needed and hot water is not reliant on weather patterns, charging facilities in the rooms provided and important amenities like hair dryers added! All these changes are important changes from the days of our simple camps. The Volcanoes family, from guides and waitresses to lodge managers, sales consultants and other office staff in Kampala, Kigali and London are committed to ensuring that you have a distinctive, unique and memorable lodge experience while on a gorilla or chimpanzee safari. We employ over a hundred staff in Rwanda and Uganda, most of whom are based at our lodges. Empowering local staff at all levels of management is a key aspect of Volcanoes’ philosophy and is exceptional among leading lodge companies. Staff from the region – Rwanda, Uganda, DRC and Burundi benefit from Volcanoes’ extensive training programs and manage guest experience from beginning to end. Today our staff are complimented for the exceptional level of service they share with our guests. As pioneers of developing and promoting sustainable tourism for twenty years, in March 2017 the Dian Fossey Map Room was opened at Virunga Lodge. 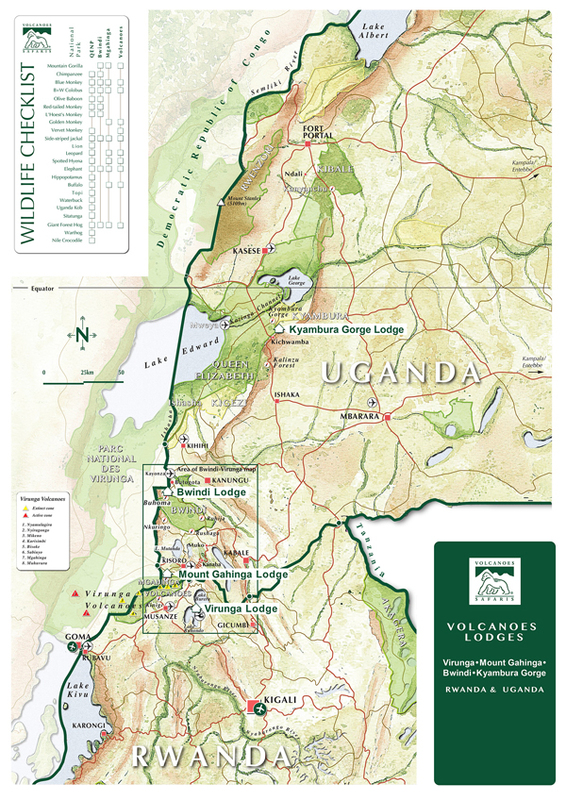 The Map Room pays tribute to the unique contribution of Dian Fossey and other conservationists, to mark the 50th anniversary of the Karisoke Center. An exhibition and catalogue, entitled ‘Explorers and Conservationists of the Virunga Volcanoes’ curated by Giulia Ajmone Marsan was formally launched.